To dance with Jareth the Goblin King in a magical ballroom wearing an extravagant gown may not be every girl’s fantasy, but watching Jennifer Connelly and David Bowie in that setting has inspired many daydreams and wedding dress designs. In a dramatic transformation, Connelly’s character Sarah, having bitten an enchanted peach, changed from a sullen teenager wearing jeans to a ripe young woman in a beautiful dress. Navigating the confusing society on the dance floor, complicated by masked faces and ambiguous looks from Bowie’s Jareth, Sarah finds her way to and away from him, realizing what her next move should be and making a giant leap toward maturity. The richness of the scene was a joy for the costumers and mask designers. The lack of dialogue and reliance on the music played to Jim’s strength in visual storytelling. And as a father of teen-aged girls, his direction brought additional depth related to his personal experience. 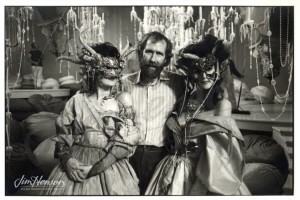 In addition, Jim always liked masquerade parties and this was his opportunity to host an incredibly imaginative one where everyone cooperated with the dress code. See Sarah and Jareth on the dance floor. Learn more about the masked balls hosted by Jim in New York. 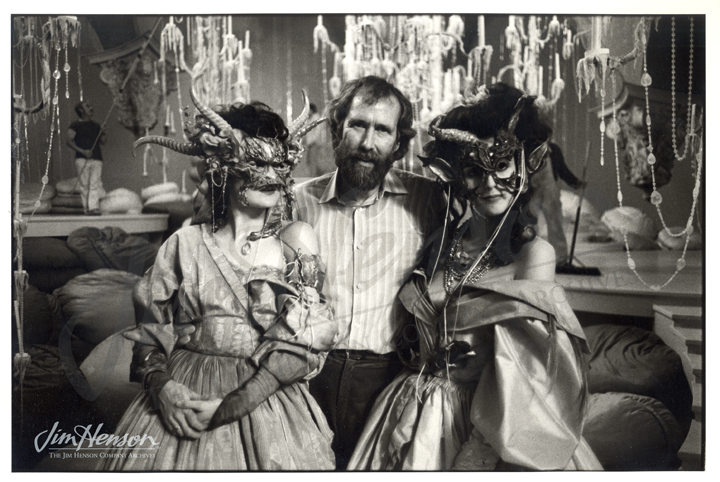 Jim on the ballroom set with two masked dancers; one is his daughter Cheryl. Photo by Nancy Moran. Jennifer Connelly in her ball gown with her (frog) prince on the cover of Muppet Magazine, Summer 1986. This entry was posted in 06-June '85, 1985, Labyrinth and tagged David Bowie, Jareth, Jennifer Connelly, Sarah. Bookmark the permalink.